Size: 502 sq.ft. - 1702 sq.ft. Kolte Patil Developers is the luxury real estate brand based in Pune. Recently the group has launched a big ticket sized township sprawling onto 420 Acres of land parcel nestled at Hinjewadi locality, Pune. KPDL has titled this township as "Life Republic" which got launched in the year 2010 and they are focusing to fetch more project in Pune areas as there are growing lots of demands for micro homes. This is a mixed use project with the biggest 5 acres entrance plaza& 150 feet wide internal roads. Inside the township the builder has built an International School, convenient stores and more under one roof. Life Republic township is been registered as P52100002682, P52100007511 under Maharashtra Rera. Towers A and G in 1st Avenue & Towers C & D in 3rd avenue are ready for sale and the rest will be delivered by December 2020. Life Republic homes are meant for nuclear as well as joint family. At Kolte Life Republic the residents will experience international living with a full-fledged road to be built such that can be used for walking, cycling & driving. Presently there are 16 towers is been built with the typologies of 1 BHK apartments, 2 BHK apartments, 3 BHK apartments and 4 BHK apartments. Each tower will compromising 20 floors and in total this luminous lifestyle will have more than 4000 units with good quality of materials for Structural, Painting, Electrical, Plumbing, Flooring, Kitchen and other specifications. These residence options are ranging from 610 Sq.ft and goes upto 1700 Sq.ft. The township is created with a healthy balance between natural & man-made environment. Life Republic is accentuated by lush green and water landscaping. The pricing of 1 Bed homes starts 29 lakhs onwards, 2 Bed at 48 Lakhs, 3 Bed apartments price starts from 62 lakhs onwards and 4 BHK at 1.80 Crore. Kolte Patil Developers Pvt Ltd firm was established in 1990. It is one of the famous construction companies in Bangalore & Pune. Till date Kolte Patil has delivered about 1.3 Crore Sq.Ft of developments& in Mumbai city the developers will start redevelopment projects. KPDL projects come with eco-friendly developments, customer satisfaction, price affordability and the entire team actually reflects company's core value. Kolte Patil Developers have taken luxury to a whole new level with offerings of luxurious & premium property. From 2 decades the group has housed about 30 projects out of 93 projects. The group has also been honoured with many awards for their presence &work in the sector. The properties of KPDL offer compact 1 BHK to luxurious 2 BHK, 3 BHK, 4 BHK & 5 BHK apartments. Hinjewadi is the IT hub of Pune west zone. Hinjewadi is having multiple phases. Phase 1, Phase 2 & Phase 3 are completed and further development of other phases to be started soon. Pre Primary school, Secondary School, Higher Secondary School, best Hospitals, IT Institutes are very reputed infrastructures near to Life Republic Township with recreational places like Saras Baug, Lonavala & Snake Park are situated close to Hinjewadi phases. Hinjewadi, Pune is presenting top notch residential projects – Eon Homes, Citrine, Gera Adara, Godrej 24, ITrend Homes, Spring Woods, Global Lifestyle, The Cliff Garden, Basera Eternity and the list goes on.This western suburb of Pune is linked with 3 major roadways which meet at Mumbai Bangalore Highway, Hinjewadi IT Park & Mumbai Pune Expressway. 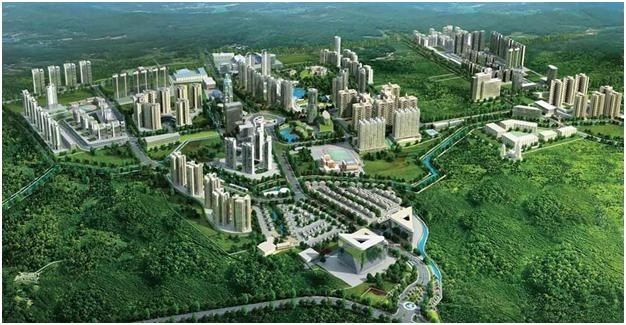 The Township is situated at Hinjewadi Phase 2, Survey No. 74, Marunji Road, Pune, Maharashtra – 411057, India. Life Republic Township offers lots of space and privacy with several amenities to inhabitants - Tennis & Basketball Courts, Indoor games, Equipped Gymnasium, Jogging Track, Cycling Track, Swimming Pool, Pool Deck, Resort style Sit outs space, Aerobics, 24 hour security services, Clubhouse, Amphitheatre, Separate area for Yoga & Meditation, Multi Cuisine restaurants, Senior Citizens Zone, landscaped gardens, Play Area for children, Cricket Pitch, baby pool, skating court, theme parks, 4 kilometres jogging and walking track with acupressure walkway, Water treatment plant, Fire Station, Tiered Seating etc. Schools – Akshara International School, St. Timothy English Medium School. Bank/ATM(s) – ICIC Bank, Citi Bank. Hospitals – Gurukrupa Hospital, Hinjewadi Hospital. Parks – MP Residency Park, Sargan Garden. Supermarkets – Ambika Supermarket, Moti Supermarket. Bus Stations – Infosys Phase 2, Emecure, Wipro Company. Railway Stations – Dehu Road station, Chinchwad Railway Station.